Give a gift that is unique and cherished! What a great gift for a family member, teacher, friend, neighbor or yourself. You get a custom, 2 ply flag on a heavy duty car pole for just $29.95! You just write in the comment section the name of the family and the names of the children and we will send you a proof of what it looks like. You can choose the color of the background and specify if you would like anything significant about the stick people and/or add pets. You can have as many people as you like. 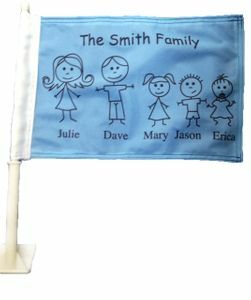 You do not have to have the names of the family on the flag. It is up to you. If you know the ages of the children, you can indicate it so we can make it as true as possible. These flags are made to last. They are 11" x 15.5" and are double sided, double stitched around the edges and triple stitched on the corners. If you would like more information, give us a call at 1-866-982-3524 or email Lorraine at lorraine@flagsoncars.com.